Map showing area in question. Only roads in green are legal for motorized use. About 16 sections shut down to motorized use when the DNR & Department of Wild Life expanded the Green Dot area in 2005. Section numbers 3,4,5,6,7,8,9,10,14,15,16,17,18,20,21& 22 have no green dotted roads. Started to enforce in 2011 at top of Taylor Ridge. Our group started investigating November 2011. “Mr. Reid my name is Ken McNamee and I am the Alpine District Manager in the Southeast Region for the Department of Natural Resources. I have been asked to contact you and discuss your concerns about the road status in the Upper Wenas area. If you can let me know what are the best times and dates for me to call you along with your phone number, I will be glad to call, so we can discuss your concerns in more depth if you would like. Ken states that the area I marked in red is closed to vehicles. Ken says they had trouble getting the private landowners in sections 5,7, and 9 agreeing to green dot roads through their private property. He says this year was just the start of the enforcement in this area. Enforcement of the road closures will be expanded in following years. He further states that the access from the South Fork Manastash (Barber Springs Rd) will not be opened in the foreseeable future. I asked about getting the road around Hudson Mt. Through Barber Springs Green dotted and he said there was no access out of Barber Springs without crossing private property. I next offered that if the Hudson road was green dotted up to the ridge road and it (ridge road) was green dotted back east to the Taylor Ridge road, that doing this would open up “some” of the area. He suggested that I work with Ron Rutherford on this. We are presently working by email with Ron Rutherford & Doug Conner who have worked with the Washington State & Federal Governments on ORV land-use closures for years. Ken McNamee has worked with them before. 2012 Update... There was absolutely no enforcement during the 2012 hunting seasons. Our camp and the ones next to us moved our camps out of the new green dot area. We followed the rules! But watching the area during the seasons we saw no enforcement and the rule breakers got to drive, camp & hunt in our old hunting grounds without being challenged. (just as we expected) This makes us all extremely frustrated with the DNR & Game Department. Talking with a game agent, (temp from Tri Cities) He stated he knew nothing about the expansion of the green dot area. At this time we have about 47 people on our list of concerned public land users. 2013 Update... We are presently working on a letter to send out to (citizens & officials). A summary letter has been sent out to get a show interest from user groups and hopefully find any parallel work being done. 1. The Barber Springs Ridge / Hudson Creek Hill area west of Ellensburg (generally the north half of T17N R16E – see Map 1 below) has been included within the LT Murray Cooperative Road Management Area, which is a Green Dot road management area. As such, only roads specifically designated and signed as green-dot are open to public vehicular use. No road to or through the Barber Springs Ridge / Hudson Creek Hill area shown on Map 1 has been designated as a green-dot road. 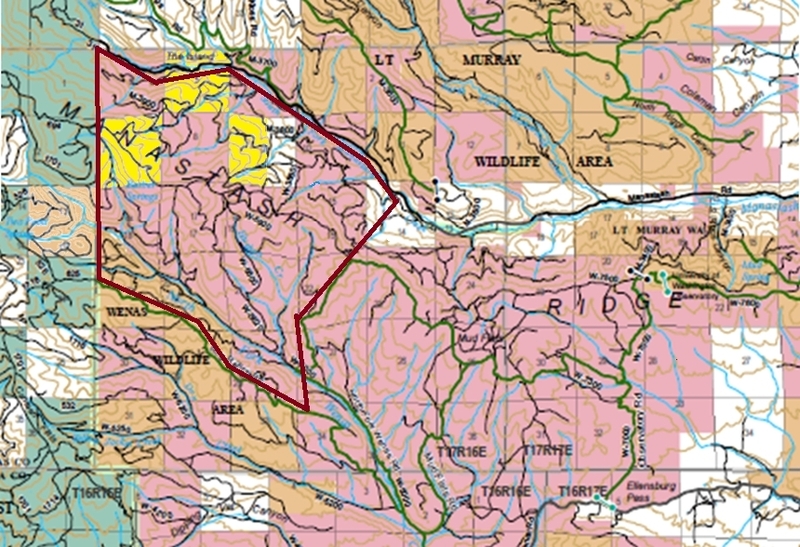 As such, no public vehicular access to/through the Barber Springs Ridge / Hudson Creek Hill area is permitted, in spite of the area containing almost 7,000 acres of publicly-owned lands (State Department of Natural Resources), and an almost 100-year history of widespread recreational use of these lands and roads under their prior private ownership (mostly Boise Cascade). Department of Natural Resources (DNR) and Department of Fish and Wildlife (DFW) are purportedly enforcing these restrictions, writing tickets and assessing fines, to violators of the Green Dot restrictions. 2. In spite of the Green Dot Area designation, there is no signage indicating the area is now a restricted area. Maps of the area that are broadly-available to the public are mixed as to whether they show the area as restricted or not restricted. Verbal replies from DNR and DFW agency personnel when asked about a Green Dot closure of the area have been inconsistent as to whether the area is open or closed to public vehicle passage. Given the inconsistency and the general lack of public information, coupled with the long-standing recreational use of the area, any enforcement and tickets/fines are more apt to catch uninformed, long-term users of the property, than knowing, willful violators of the Green Dot regulations. 3. Even though DNR and DFW both indicated they would be substantially ramping-up Green Dot enforcement efforts in this area through 2012, there was no evidence of any enforcement activity through the early archery, muzzleloader, or modern-weapon deer or elk hunting seasons in 2012. There was extensive public vehicular use of the area during these seasons, including established hunting camps. This lack of promised enforcement was extremely frustrating and discouraging for hunters who voluntarily moved their traditional hunting camps out of the area, and who hiked one and two hours into the area in order to hunt traditional spots on public lands – only to have to put up with illegal camps and significant vehicle traffic. If the Green Dot regulations cannot be effectively enforced, the regulations should be rescinded. 4. The area contains parcels owned by 13 different private landowners. Providing access through a green-dot restricted area to these private owners, their guests and service providers diminishes the wildlife benefits from a Green Dot Area designation. Especially problematic is one relatively new private owner, NJK Timber Company, LLC, out of Spokane, who apparently refuses to allow any public passage over their land. Most of the traditional access roads through this area, which have been used extensively by the public for many generations, end up passing through at least a small part of NJK Timber ownership. It is reportedly NJK’s objections that have kept DNR from designating any road through this area as a green-dot road available for public use. Given these serious private ownership constraints, we question whether this area is well-suited for a Green Dot Area at all. a) DNR and DFW should work with NJK Timber Company, LLC to jointly designate some access routes through this area as green-dot roads, to provide the public a means of traversing the area by vehicle, and providing public access to some portions of the nearly 7,000 acres of publicly-owned lands in the area. These routes may be the traditional access routes through the area, other non-traditional routes, or some combination - but there needs to be some designated green-dot roads if this area is to be retained as a Green Dot Area. b) If a network of green-dot designated roads can be mutually agreed upon between DNR, DFW and NJK Timber (and any of the other private owners who may be directly impacted by this decision), then DNR and/or DFW needs to adequately sign the area at all green-dot road access points, and all traditional road access points that are not green-dot designated. Green-dot designated roads should also be signed at all major intersections within the area, so it is clear which roads are open to public vehicular travel and which are closed. DNR/DFW should coordinate with other public agencies, and the major private mapping firms, to update the area maps broadly-available to the public to display the Green Dot Area and the open green-dot designated roads. Finally, DNR/DFW needs to implement a program to effectively enforce the Green Dot regulations. Until such time as the above conditions can be satisfied, the area should be “suspended” from any Green Dot enforcement, and any inquiring recreational users should be so informed of this temporary “suspension”. c) If DNR, DFW and NJK Timber cannot reach agreement on an green-dot designated access road network, then DNR should aggressively pursue purchasing the NJK Timber lands, so public access to the almost 7,000 acres of publicly-owned lands can be restored. If purchase of these lands is determined to be impractical, then the area should be permanently withdrawn from the Green Dot road management area. 1) Distribute this position statement to other recreational users and user groups, and compile a listing of individuals and groups who support this position. Names and email contact information for supporters would be most helpful. 2) Work cooperatively with DNR and DFW through established channels to address our issues, refine our suggestions, and achieve our overall goal to reinstate some level of public vehicular access to and through the Barber Springs Ridge / Hudson Creek Hill area. 3) If we find that the approach described in #2 is unlikely to achieve our overall goal, look into implementing a broad-based letter-writing campaign to appeal to State executives and to our legislative representatives and senators to address this issue. If you support the position described above, please let the person who sent you this email know of your support. We will compile a master list of supporting individuals and organizations. If you are willing to provide your email contact information, we will attempt to keep you informed of progress as we proceed with this effort. If you have questions, or suggestions, regarding this issue or our position, feel free to contact either Michael Brathovde (mabrathovde@gmail.com) or Mike Reid (mxreid@msn.com). Finally, if there are other recreational users or groups you feel might be interested and supportive of this effort, please forward this information onto them. Hopefully, by working together, we can restore some level of public access to and through these popular recreational lands.